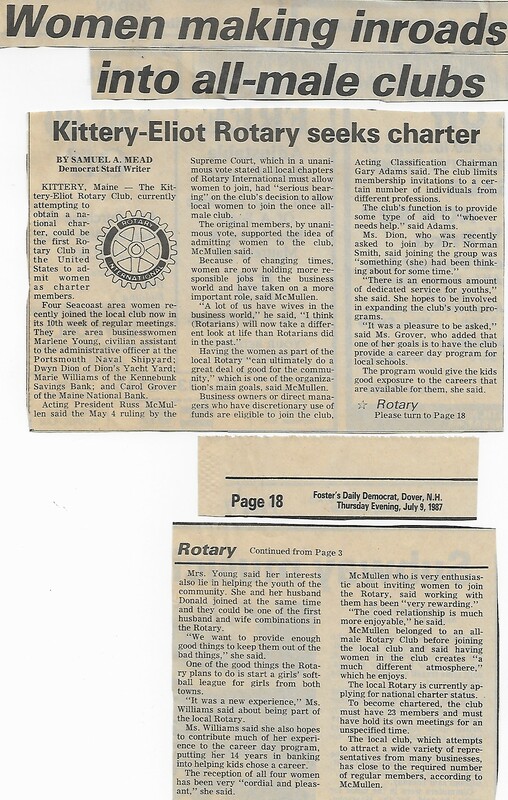 This page tells the entire history of the Rotary Club of Kittery, Maine from the days before it was an official club up through its 25th Anniversary celebration. The continued efforts, interest and dedication of many people helped bring this new club into being. The genesis of our club began during District Governor Sam Giftos term, 1985-86. It was then the possibility of a Kittery club was seriously considered. Bud Watt and Marty Ulan, special representatives of the District Governor, discussed this possibility and worked to find potential Rotarians with the time and inclination to begin organization work. During a meeting with Joe Hahn, District Governor 1986-1987, Joe mentioned that an active Rotarian from Rockland, Pat Donahue, was moving to Kittery as Superintendent of Schools. In the fall of 1986, Marty Ulan and Pat Donahue met and organizational efforts were initiated. Marty Ulan approached the Directors of the York Club to act as a sponsoring club. Things moved slowly until Bud Watt referred Dave Hager to Marty Ulan. A list of potential members was developed and the first meeting of Marty Ulan, Pat Donahue, Dave Hager and Gary Adams was held April 24, 1987 at Valle’s Restaurant. 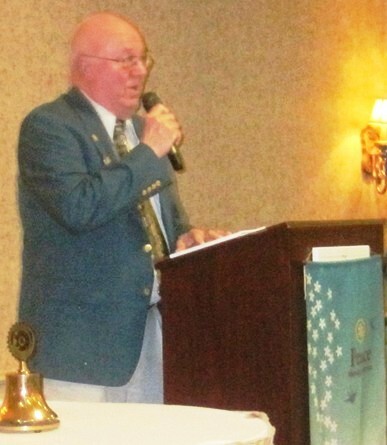 When Russ McMullen, Past President 1978-1979 of the South Berwick Club, joined, weekly group meetings were started. It was Gary Adams’ suggestion that we consider women members. The York Club supported the decision and eligible women were recruited. President John Flentje of the York Club appointed an extension committee. Jeff Clark, Past President of York, 1986-1987, was chairman of the committee and the Kittery Club was started on its way. In a letter to Bill Egli, (in charge of Rotary expansion in Chicago) Marty Ulan reported that the club would soon become eligible for a charter. Our charter, with 28 Charter Members listed, was finalized and submitted on September 14, 1987 for approval. The charter draft reflected the strength of conviction to allow both businessmen and businesswomen to be of service to the community by being members. The charter was finally approved on October 12, 1987. 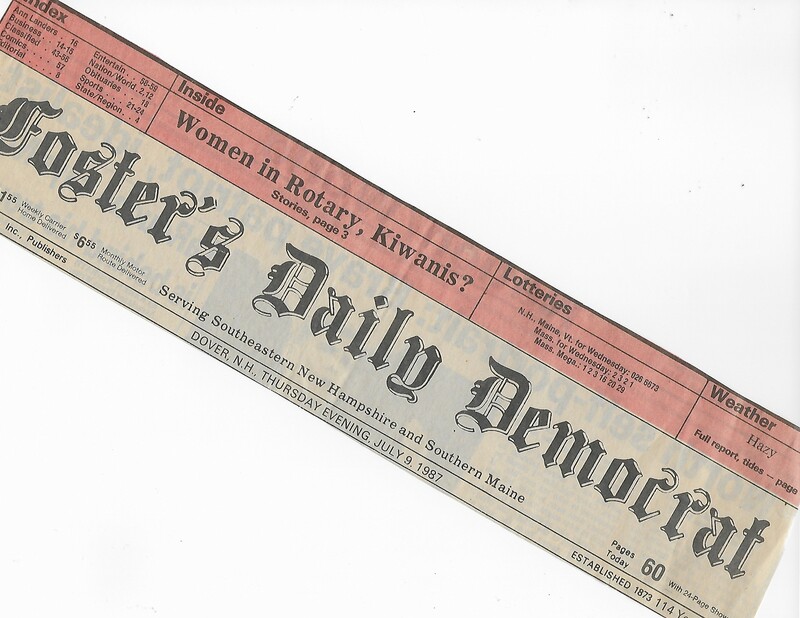 We have been told that the Kittery Club was either the first or second club in the United States to charter with women. We have contacted RI but they cannot verify this. The Youngs were our first married couple. Check out the Photo Album for pictures of our Charter Night under Archieved Photo Albums. Top row from the left to right: R. David Hager, Jr., Harrison Lemont, Norman Smith, Sr.and Patrick Donahue. Third row from left to right: Richard Johnson, Dean C. Smith, Raymond Roy, Walter Jackson, Gary T. Adams and Russell McMullen, Charter President. Second row from left to right: Carol Sue Grover, John Kennedy, Marie Williams, Marlene Young, Sharon Anderson, Diane Steiner Johnson, Dan Thornhill, Fred McCanin, Jr., Donald Young and Raymah Morgridge. Seated left to right: District 779 Governor J. Marcel Girardeau, Dwyn Dion and Joyce Carbtree. Not in Attendance: Christine Alderson, David E. Avery, Del Blickensderfer, Leonard F. Box, Thomas J. Gentile and John Robbins. 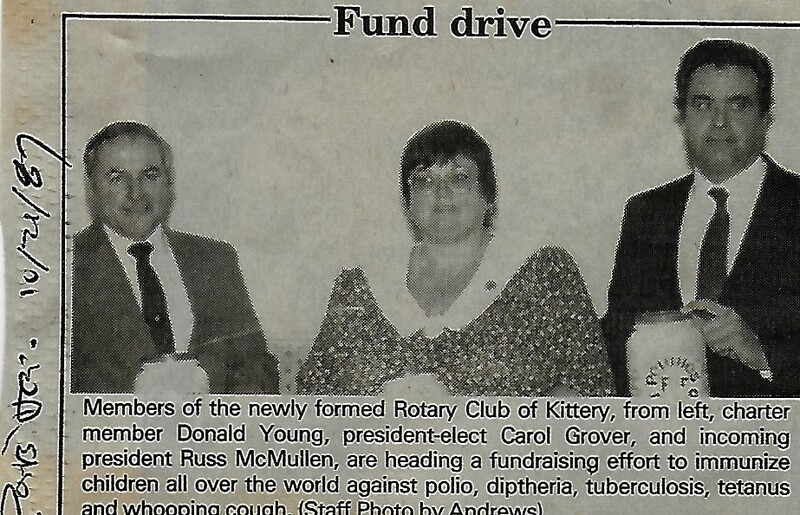 On October 21, 1987 the picture below was in the Portsmouth Herald showing that the newly former Rotary Club of Kittery, Maine was immediately getting involved in Rotary Internationals's Fund Raising efforts to eradicate Polio. to see the Program book for that year. 25th Anniversary Celebration of the Club. The Rob Gerry Quartet will entertain us during the cocktail hour & dinner. Dinner is a buffet consisting of Classic Caesar Salad, Carved Roast Beef au Jus, Chicken Marsala, New England Broiled Seafood, Sautéed Vegetable Medley, Roasted Red Potatoes, Dinner Rolls and Butter and birthday cake for dessert! 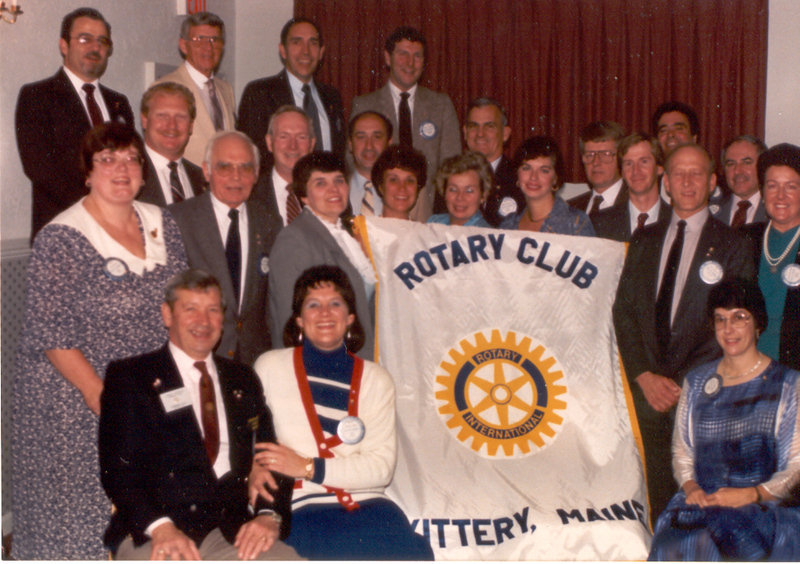 The Rotary Club of Kittery was chartered on October 13, 1987. It was either the first or second club in the Rotary World to charter with women. There were 28 charter members of which 9 were women. The sponsoring Club was the Rotary Club of York, ME. The history of how the club was started is on the Club Website under Club History. On October 19, 2012, the Club celebrated its 25th anniversary with a gala event at the Regatta Room, in Eliot, ME. The room was decorated with Rotary blue and yellow balloons on all the tables and around the room. There were many tables with actual scrapbooks on each Rotary year from 1988 through 2008 – that is the year we started our website and went digital with pictures and newsletters on the website. There were many plaques, District & RI awards from past years on display as well as theme banners from Past District Governors and 5 large blue felt banners with individual club exchange banners attached to them. It made for a very colorful room! We had a booklet with updated information on Charter Members, another with the obituaries on all former members and another with three past international projects – assistance to a college in South Africa for disabled children and adults, feeding the street children in the Philippines and our purchase and shipping of an old Kittery Fire Engine to Honduras with the assistance of the National Guard! We started the evening off with a cocktail hour which included a “special” Rotary lemonade drink created by the Regatta Room – it could be either an alcoholic or non-alcoholic drink! It seemed to go over well. We were entertained during the cocktail hour and during dinner by the Rob Gerry Quartet – Rob Gerry on bass, Richard Gardzina on saxophone, Mike Effenberger on keyboard and Jim Rudolf on drums. They were fantastic! Past President David Gooch put together a fantastic slide show that looped all evening of the pictures that he had taken and others he was provided of the club events, projects, fundraisers and fellowship events. The captions were terrific and very fitting. There were many, many laughs as the different pictures came up! Thank you, David, for the memories! At 7:00 PM President Pat Holmes, rang the bell and everyone was asked to find a seat. She did a brief welcome and started the dinner like we do our weekly meeting. She had the future and immediate past president take part. President-elect Jared Morse led us in reciting the 4-Way Test, Vice President Rhonda Dion led us in the pledge of allegiance and Immediate Past President Brad Hirst did an invocation appropriate to the evening and led us in a patriotic song. The buffet dinner was excellent and no one went hungry. We sang “Happy Birthday” to the club then the staff served the birthday cake and coffee. Once dinner and dessert was over, President Pat read a message from District Governor Marty Helman who was unable to attend as she was at another Rotary event in Vancouver. Charted Member Marie Williams told everyone about the good wishes from Marcel Girardeau who was District Governor and presented us with our Club Charter on October 17, 1987. He had sent a letter as well but it did not arrive until Monday, October 22, 2012 which was read to the club at the meeting of October 23, 2012. He was very pleased to be invited and sorry he was unable to attend. A copy of his letter is shown below. President Pat the introduced our guests – Past Rotary International Director Daniel Mooers and Shirley, PDG Joseph Hahn and Betty, PDG James Labrie and Ellen were suppose to join us but Ellen was not feeling well, PDG Morton Schmidt, PDG George Rice and Patty, PDG Marie Williams and Bruce, PDG Brad Jett and Penny, PDG Jeffrey Pelkey and Julia, PDG Gary Speers and Judy. Marie and Jeffrey are members of the club. 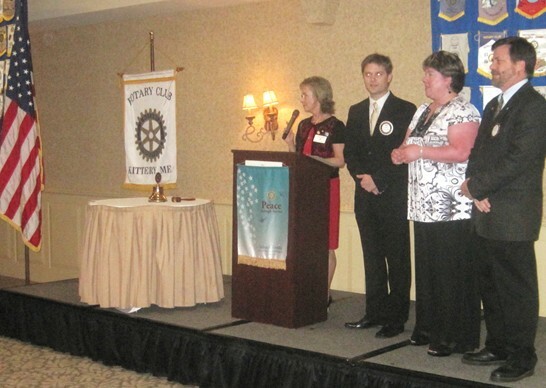 Past Assistant Governor Patty Rice and four sitting club presidents from area clubs – Kevin Raymond, Rotary Club of York (our sponsoring club), Mike Lassell, Rotary Club of South Berwick-Eliot (club Kittery sponsored), Shirley Mooers, Rotary Club of Breakwater Daybreak and Suzanne Ilsley, Rotary Club of Wells. In addition, there were three Charter Members in attendance, the Charter President, Russell McMullen, John Robbins and Marie Williams. Marie is the only charter member left in the club. There were 13 Past Kittery Club Presidents plus sitting Club President Patricia “Pat” Holmes. Each Past President when introduced was asked to tell something that they remembered from their year. There was lots of laughter! We had sixteen of the 25 current club members in attendance. See the list of Past Presidents, their year of service – Sue Czarnionka served three times, Jeffrey Pelkey served twice – and the list of current members in attendance are shown below. President Pat asked for a moment of silence while she read all the names of deceased Rotarians from the Rotary Club of Kittery. These names were all listed in the program which is shown above on this page. Charter Member Marie Williams introduced our speaker of the evening, Past District Governor Joseph “Joe” Hahn. Joe was the District Governor in 1986-1987 when we were a provisional club. His picture and bio from that evening are shown below. PDG Joe’s spoke about how everyone should get involved because it was FUN! His presentation was short but very meaningful! President Pat then asked Marie and Bruce Williams to come forward for a Paul Harris Fellow Presentation. President Pat read the presentation that Sterling & Frances Williams, Bruce’s parents were being made Paul Harris Fellows posthumously by Marie. Marie explained that she wanted to do something to honor Bruce for all his support to her when she was club president and when she served as District 7780 Governor twice. This club has had several people that have had to do things more than once but they finally got it right either the second or third time. We ended the evening with the drawing for our 50/50 raffle. One of our three newest members inducted on Tuesday, August 16, 2012, Andrew “Andy” Glazier did a very successful 50/50 raffle to benefit “Fuel & More” in Kittery. 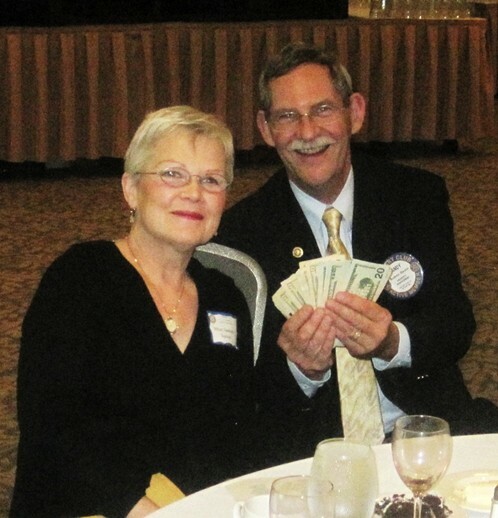 He raised $410.00 and our winner of $205.00 was Rhea Sanborn whose husband, Steve Sanborn is Club Treasurer of the Rotary Club of South Berwick-Eliot, ME. It was a great evening and a good time was had by all! 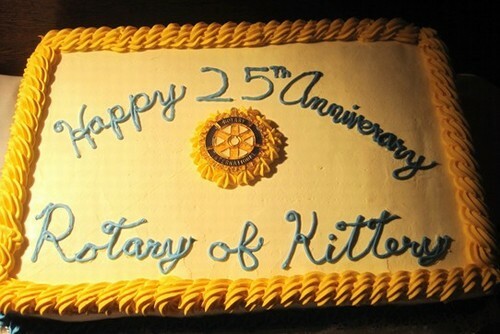 Thank you to all those that came to help us celebrate 25 years of Rotary Service to our community and the communities of the world! We also want to thank the committee consisting of Brad Hirst, Sue Czarnionka, Pam Gray, Patricia Holmes, Julie Perreault and Marie Williams for doing a fantastic job of planning this event! THANK YOU! The following letters are PDF files, Please click on the individual listings below to read them.